Article: "Cultivating a flower for our flag"
I believe, Ivo Ostyn was once a member here. Or at least had his arms designed through the design service. I cannot remember which. I like simplicity of the proposed "new" flag. Chas Charles-Dunne wrote: I believe, Ivo Ostyn was once a member here. Or at least had his arms designed through the design service. I cannot remember which. 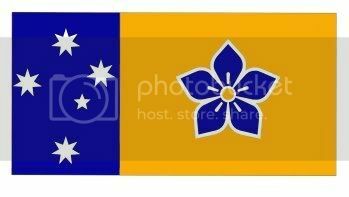 steven harris wrote: Article: "Cultivating a flower for our flag"
It's a pity that the other flag proposed by Ivo was not included in the opening post of this thread. Ivo also proposed a simplified Royal Bluebell as the floral motif - a design that would more easily be hand-drawn by the younger members of society in their school lessons on 'Social Sciences'. 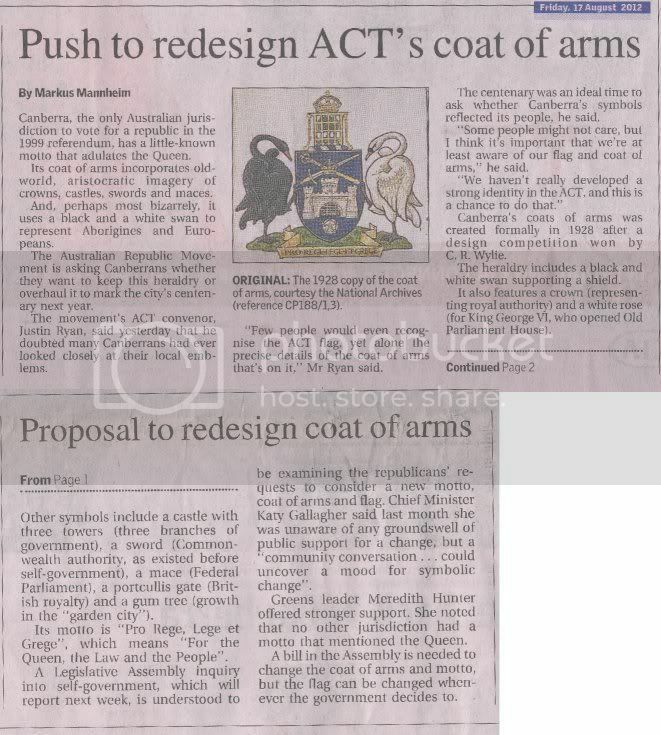 This subject initially was publicly brought to light by an article in the Canberra Times of Friday 17 August 2012, a copy of which is scanned herewith. I am reliably informed (by a later Chief Minister of the ACT) who advised me that, "I recall in about 1993 that [the then Chief Minister] Rosemary Follett conferred with the then-MLAs about a flag for the ACT. I recall that the Chief Minister insisted that one design be put forward which simply contained a cut down version of the coat of arms; I thought this was too fussy and stylistically inappropriate to be the design for our flag, but was overruled. Not surprisingly, in the quasi-plebiscite that was subsequently conducted, people voted for the design they recognised, without being aware of its inappropriate application. " So much for our ACT Legislative Assembly. This is getting off-topic but the shenanigans that have occurred in the ACT stem from the 'self government' that was foisted on the residents of the ACT back in 1988 even though an Australia-wide referendum was held ( http://en.wikipedia.org/wiki/Australian_referendum,_1988_(Local_Government)) to basically ask (amongst several motions tabled) the question 'Should the ACT become a self governing Territory or remain as we are under the umbrella of the Federal Government’, which was our original status. The vote of the ACT (as well as the whole of Australian public) was well over 60% in favour of remaining with the status quo with the Australia-wide vote of 33.61% for and 66.39% also against the motion. Oblivious to that result, the then Labor Federal Government foisted 'self government' on the ACT with damaging results to the environment and the inhabitants of the ACT. The population of the ACT is currently approximately 330,000 and all it really should have is a Town Council (similar to that in Sydney with a 2010 population of 4.6M) as well over 90% of the inhabitants reside within the urban sprawl that is generically called Canberra.